Whereas most people think of strawberries as desserts, these juicy berries can add a delicious sweetness to a savory dish. This fresh and bright salad has the perfect combination of tastes and textures. Each element of the combination … the sweetness from the fruit, tartness from the baby lettuces, saltiness from the cheese, and crunch from the nuts … compliments the others. The blush wine vinaigrette is a homemade version of a popular store-bought dressing. Making homemade dressings is very simple since most dressings, like this one, use ingredients most people already have in their pantry. Don’t be surprised if you prefer homemade versions of dressings better than their grocery store counterparts. This one for example has a brighter flavor (thanks to the freshly squeezed lemon juice), has no preservatives or MSG, and costs so much less than the bottled original. Add sliced chicken or a salmon filet and you have a complete meal. In a small bowl whisk together the vinegar, lemon juice and sugar until the sugar has dissolved. Slowly add the oil in a stream, whisking to emulsify. Season with salt and pepper to taste. 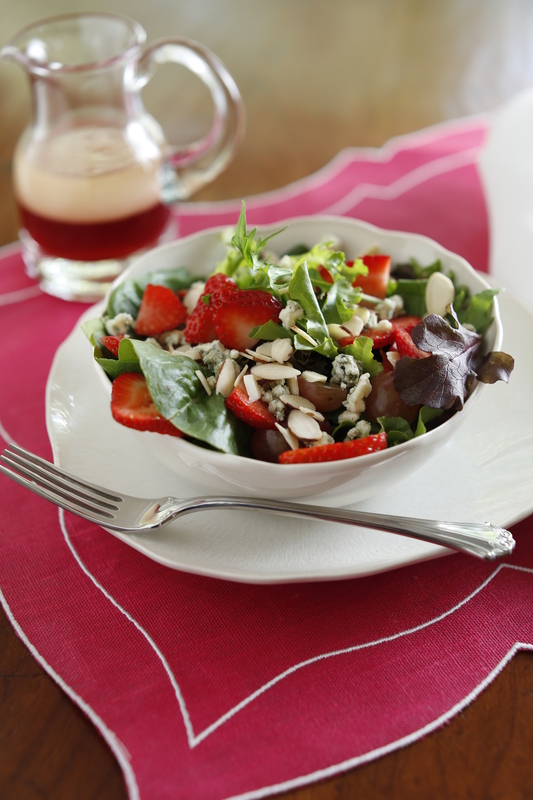 In a large salad bowl toss together the salad blend, strawberries, grapes, chives, almond slices, and crumbled goat cheese. Add the dressing to taste and gently toss. Season with salt and pepper to taste. Makes 6 appetizer or side salads. Cooking Tip: Mix and match this colorful salad using your favorite ingredients. Try substituting spinach or dried cranberries. Goat cheese is also a nice substitute for the blue cheese. Photo by the talented Justin Fox Burks. Food Styling by Jennifer Chandler. 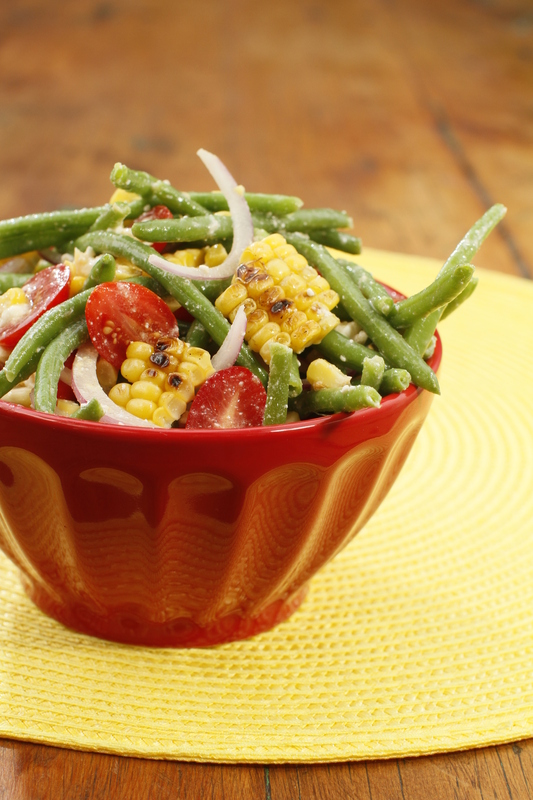 This easy summer side dish is a great addition to any backyard barbecue. I like to make this colorful and chilled side dish ahead of time so I am free to enjoy time with my guests. Preheat a clean grill to medium-high with the lid closed for 8 to 10 minutes. Lightly brush the grates with oil. Brush the corn with the butter. Season with salt and pepper to taste. Place the corn on the grill. Close the lid and cook the corn, turning occasionally, until just tender and slightly charred on all sides, 8 to 10 minutes total. Transfer the corn to a cutting board to cool. When the corn is cool enough to handle, use a sharp knife to carefully slice the kernels off the cob; discard the cob. Place the kernels in a large bowl. Add the beans, tomatoes, and onion. In a small bowl whisk together the mustard, vinegar, and oil until well combined. Add the dressing to the vegetables and toss to coat. Add the goat cheese and toss. Season with salt and pepper to taste. Cooking Tip: Blanching is a culinary term for cooking a vegetable until it is just crisp-tender. Bring a medium pot of salted water to a boil. Add the vegetable and cook until vibrant green and crisp-tender, 1 to 1 1/2 minutes. Drain and rinse under cold water to stop the cooking process. Do-Ahead: The vegetables and dressing can be prepped the night before. Toss all the ingredients together before serving. Variation: Feta cheese would be a delicious substitute for the goat cheese in this salad. Have a surplus of summer squash? Zucchini, yellow squash and eggplant have thrived in my veggie garden this summer. I keep looking for new ways to enjoy my garden’s bounty! This salad is one of my favorite. This is a quick and easy vegetarian salad you can make with grilled summer squashes. The base of the salad is quinoa. It you are not familiar with it, quinoa is a high-protein, gluten-free grain that cooks much like rice and has a texture similar to couscous. It makes a delicious and healthy base for a salad. Preheat a clean grill with a grill basket or screen to medium-high with the lid closed for 8 to 10 minutes. Light brush the grill basket or screen with oil. In a large bowl toss together the red onion, eggplant, red bell pepper, zucchini, and olive oil. Season with salt and pepper to taste. Transfer the vegetables to the grill basket. Close the lid and cook, turning once or twice, until the vegetables are tender and slightly charred, about 5 to 7 minutes per side. Place the prepared quinoa in a large bowl. Add the grilled vegetables and toss to combine. In a small bowl whisk together the remaining olive oil, red wine vinegar, lemon juice, garlic, and red pepper flakes. Pour the dressing over the salad and toss to coat. Season with salt and pepper to taste. Garnish with cilantro. Serve warm or chilled. 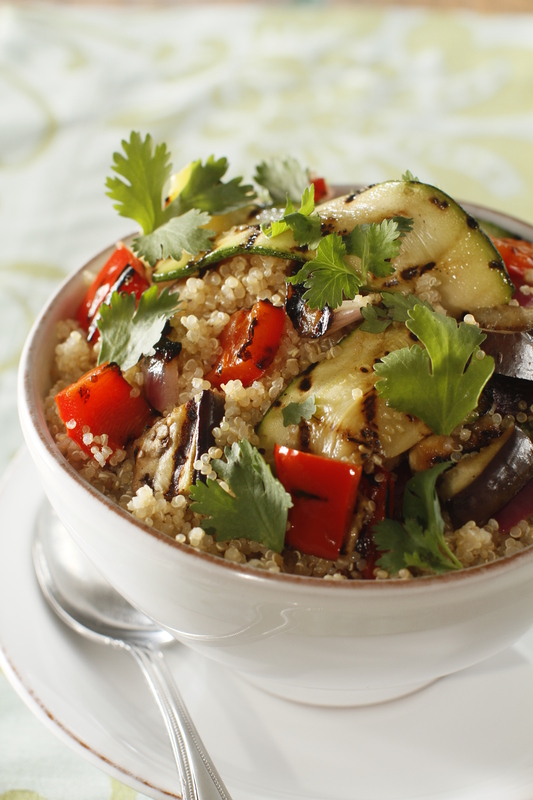 Do-Ahead: The quinoa can be made a day ahead. Store covered in the refrigerator until ready to use. Grill Pan Friendly: The veggies can be grilled indoors on a grill pan. A good relish can make an everyday chicken breast into a show-stopper. This Greek-inspired tomato relish from my new cookbook Simply Grilling is just such an example. To make the Greek Tomato-Olive Relish: Place the tomatoes, olives, red onion, oil, and vinegar in a medium bowl. Toss to combine. Add the feta cheese and mint and gently toss to combine. Season with salt and pepper to taste. Refrigerate until ready to serve. To make the chicken: Preheat a clean grill to medium-high with the lid closed for 8 to 10 minutes. Lightly brush the grates with oil. Season both sides of the chicken with the Italian seasoning, salt and pepper. Place the chicken on the grill. Close the lid and cook, turning once, until no longer pink in the middle, 6 to 8 minutes per side. 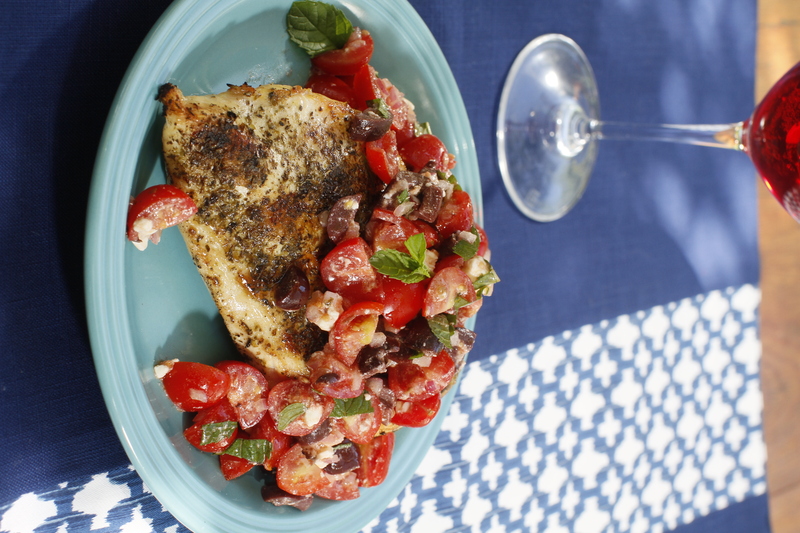 To serve, place the chicken on the plate and top with a generous spoonful of the tomato-olive relish. Cooking Tips: To evenly cook boneless, skinless chicken breasts, I suggest pounding them to a uniform thickness before grilling. Dried Italian seasoning is a mixture of several dry herbs. To make your own, combine 1 tablespoon each of dried basil, dried parsley, dried oregano, dried marjoram, dried thyme leaves, dried rosemary, and dried sage. Store in an airtight container in a cool, dark place for up to six months. Do-Ahead: The tomato-olive relish can be made 4 hours ahead. Store covered in your refrigerator until ready to serve. Variation: Fresh basil would be a delicious substitute for the fresh mint. Grill Pan Friendly: Don’t have a grill or the weather is not so great, this dish can be made inside in a grill pan. Photo credit: Photo by the talented Justin Fox Burks. 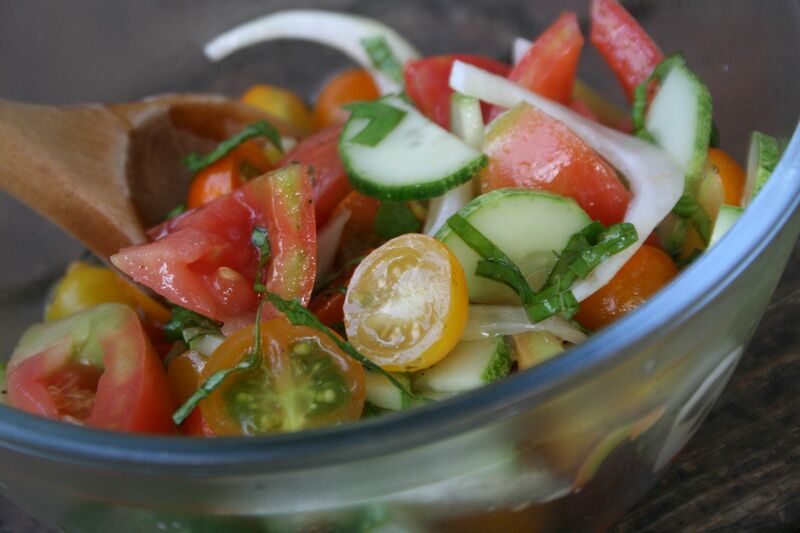 I have always loved a light and refreshing Tomato and Cucumber Salad. It is so easy to make and truly lets the flavors of summer produce shine through. Two years ago we planted our first garden. No one told me that 8 cucumber plants is way too much for a family of four! So needless to say I was whipping up this salad every week with tomatoes I bought at the farmers market. This summer is our third year of gardening and it looks like we are finally getting the hang of it! We are already on to a bumper crop of tomatoes of all varieties … and I only planted 3 cucumber plants (which will still be more than enough to feed our family!). To make my version of this “fresh from the garden” salad, I love using all types of tomatoes … heirlooms of all shades and sizes. I also throw in sweet Vidalia onions in lieu of the white onions the classic recipe calls for. Fresh basil from the garden also adds a delicious touch to this dish. Place the cucumbers, tomatoes, and onions in a large bowl. Add the vinegar, olive oil, and basil and gently toss to combine. Season with salt and pepper to taste. Cooking Tip: If you can’t find heirloom tomatoes near you, this salad would also be delicious with any ripe tomato from garden or market. 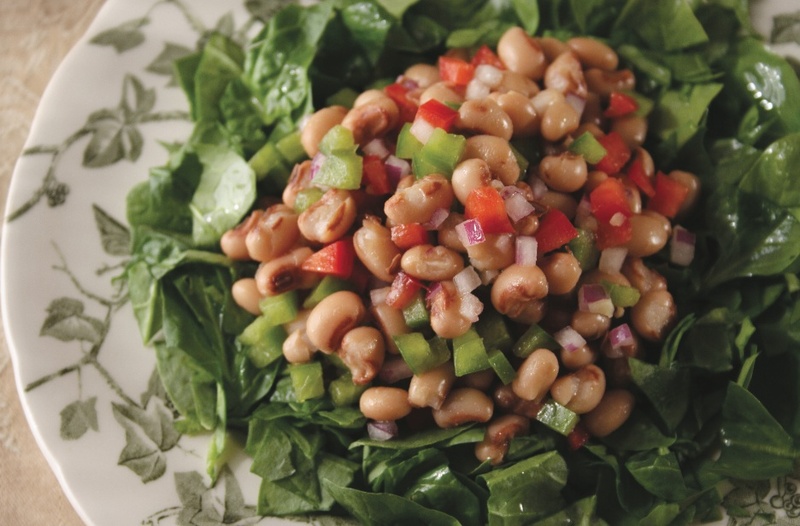 Nothing is more Southern than the combination of black-eyed peas and greens. For a lighter version, I substituted tender baby spinach leaves for the traditional collard greens. To make the Red Wine Vinaigrette: Place the vinegar in a small bowl. Slowly add the oil in a stream, whisking to emulsify. Season with salt and pepper to taste. To prepare the salad: In a large salad bowl toss together the black-eyed peas, red bell pepper, green bell pepper, red onion, jalapeño, and garlic. Add the vinaigrette to taste and gently toss to coat. Season with salt and pepper to taste. Divide the spinach among the plates. Top with a generous spoonful of the black-eyed peas. Serve immediately. Tips: For an authentic Southern touch, add a dash of hot sauce to your black-eyed peas for a little extra zing. This Black-Eyed Pea Salad also makes delish dip served with Fritos! I don’t think any fruit says summer and back-yard barbecues like watermelon. I love, my kids love it … a juicy, refreshing slice of watermelon is just hands-down a quintessential favorite. Most people only think of serving watermelons sliced … but one of my favorite ways to enjoy this juicy treat is in a salad. I just love the whole “savory versus sweet” thing that goes on when you match ripe, sweet fruits with savory ingredients. In the South, we like to salt our watermelon slices. (Don’t make a face if you haven’t tried it!) The piquancy of the salt actually enhances the melon’s sweetness. To get that same experience in this salad, I add crumbled Feta cheese. This salty cheese works the same way Kosher salt would on a cold slice of watermelon. Yum! So for the next time you buy a watermelon … think salad rather than slices. In a small bowl whisk together the lemon juice and red wine vinegar. Slowly add the oil in a steady stream, whisking to emulsify. Season with salt and pepper to taste. 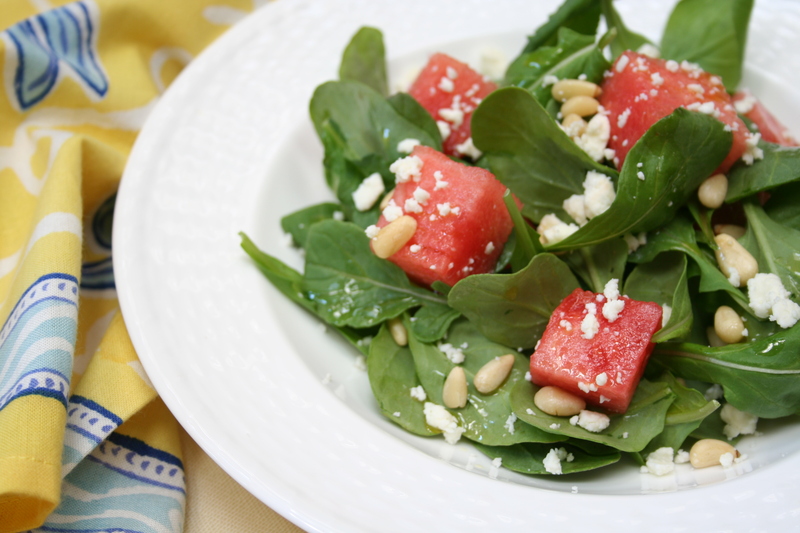 In a large salad bowl toss the salad blend, watermelon, feta cheese, and pine nuts. Add the vinaigrette to taste and gently toss. Tip: Add fresh mint leaves for an interesting zing to this refreshing salad.